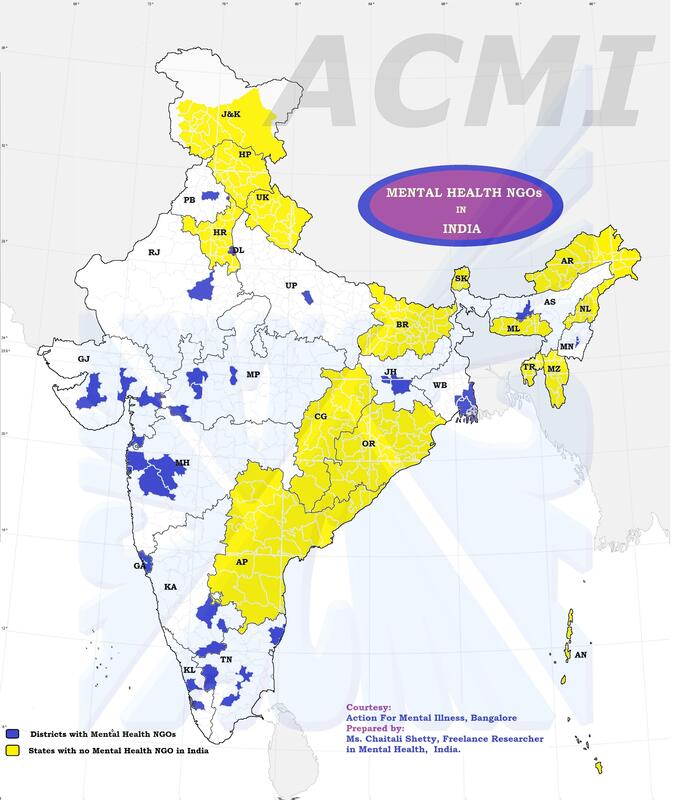 The Ministry of Health and Family Welfare, Government of India has appointed a Policy Group to prepare a National Mental Health Policy and Plan. The Members of the Policy Group are : Keshav Desiraju, Jagdish Prasad, Akhileshwar Sahay, Nirmala Srinivasan, Vikram Gupta, Thelma Narayan, Sanjeev Jain, Vikram Patel, Anirudh Kala, Vandana Gopikumar, Alok Sarin and Soumitra Pathare. a. To prepare a situational analysis of the need for mental health care in the country and the current provision of mental health care in the country, including issue of human resources, essential drug procurement and distribution, advocacy, prevention of mental illness, rehabilitation and care and promotion of mental health and rehabilitation. b) To carry out a systematic review of the evidence base for the policy measures proposed below. c) To take the draft Mental Health Care Act into account when drafting the National Mental Health Care Policy and Plan and recommend changes to the proposed draft Mental Health Care Act, if necessary, to support the National Mental Health Care Policy and Plan. d) To prepare an evidence based National Mental Health Care Policy for the Ministry of Health and Family Welfare stating guiding values, principles and objectives of such a policy and identifying priority areas for action. e) To prepare a National Mental Health Care Plan with specific reference to the National Mental Health Programme and the District Mental Health Programme with specific strategies and activities to implement the priority areas of action identified in the National Mental Health Care Policy and to further prepare an estimate of financial resources required to implement the Plan. f) To conduct broad-based consultations on the above issues with mental health stakeholders in the country before finalizing the Situational Analysis, the National Mental Health Care Policy and the National Mental Health Care Plan. Prof Daniel, A very welcome observation and the importance of teachers.But then you see how the teacher in a respected University made a child to lick her own urine for bed wetting.Most of the teachers in our schools just do not have self esteem unlike my times when we had good and bad teachers but they are all respected. Those days Britishers had teachers with 8th pass but they have to undergo teachers training for one year.Today’s BeDs and PHds just donot have respect for their own profession and command respect. As you correctly suggest the teachers in the primary and secondary stage require training not only in basic mental health problems but also in Suicide prevention and also anger management of children and learning difficulty children. This will go a long way but then in a country where “Suicide” is glorified, one has to instill by that syllabus the “suicide” is a cowardly act and also teach children that failure in exams is not the end of the world. Mental health is vital for individuals, families and communities, and is more than simply the absence of a mental disorder. Mental health is defined by the World Health Organization (WHO) as ‘a state of well-being in which the individual realizes his or her own abilities, can cope with the normal stresses of life, can work productively and fruitfully, and is able to make a contribution to his or her community’. A mental disorder is any illness that affects people’s emotions, thoughts or behavior, which is out of keeping with their cultural beliefs and personality, and is producing a negative effect on their lives or the lives of their families. There are many different types of mental disorders ranging from common disorders such as depression and anxiety to more severe ones such as schizophrenia. Effective treatments are available for people with mental disorders, and many types of mental disorder can be managed at the primary health care level with complementary support from community-based workers and community members. The teacher plays a significant role in the promotion of the health of the children under his/her care. Teachers spend most of the school hours with children and are familiar with them. They can detect the signs and symptoms of common mental health problems at the earliest in the classroom setting. It is expected that out of 51 lakh children (6-11 years of age), approximately 5 lakh (9.8 %) children suffer from mental health problems in Karnataka. There are 46, 24,057 children in the age group of 6-11 years enrolled in 52, 023 primary schools, taught by 63,523 teachers in Karnataka. In Bangalore urban district, there are 4,86,684 children in the age group of 6-11 years enrolled in 1153 primary schools, taught by 10673 teachers. Whereas in Anekal Taluk, 16,726 children (6-11 years old) are enrolled in 248 Government and government aided primary schools and taught by 903 teachers. There is no organized school mental health programme for teachers in Karnataka. There is no record of active participation of teachers in the school mental health programme. However there are opportunistic school health programme, in Taluks. There are no full time school health nurses assigned to these schools. If a “resource person” such as teacher has to play a vital role in the school health programme, he/ she should be adequately trained and equipped with adequate knowledge and skills. This will enable the nursing personnel working in the area to render their services to other needy areas also. •	Recognize when children in their school are experiencing symptoms of a mental disorder. •	Respond appropriately to children experiencing a mental disorder. •	Refer these children for appropriate health care. •	Support children with mental disorders and their families. •	Promote mental health within their communities. In this context, the importance of a teacher becomes vital in safeguarding and promoting the mental health of children and early identification of deviations from normal. The school is one of the most organized and powerful systems in the society, which presents opportunity to work through it and to influence the health and well being of those who come in contact with it. This is especially true in an Indian setting where there is considerable shortage in mental health facilities for children. Teachers are the biggest resources available in India. The Teachers can effectively deal with many of the problems in the area of mental health within resources available close to them. It is important to identify the disorders at an early stage by teachers provided they are trained to identify and detect those disorders. Thanks for your mail which is appreciable at our end.It is the need of time that all concerned who are caring adolescent health in India should be active partner of the mental health policy of India. Here again I would like to emphasize that in our academy Indian Academy of Pediatrics there are 20,0000 pediatrician and in Adolescent health academy nearly 1300 members who are caring adolescent issues all over country . Out of numbers of members mostly they are qualified or trained by us or WHO and other NGOs in country. It will excellent that if IAP and AHA is given opportunity to take care of adolescents and children who have mental health problem in our country. Dear Doctor tuteja, Most of the mental illness show signs only during adolscence, may be due to hormonal changes or peer pressure or whatever reason.Suicides by 10/12 students is another area which can be easily prevented by proper councelling with both parents and students. Dr J S Tuteja,Consultant Adolescent Medicine. Chairperson . Adolescent Health Academy Of IAP. Most of the adult mental health problems starts from childhood to adolescence .Problems are increasing day by day , causes are manifold particularly in this vital and sensitive period of life. it may be due to parent child relationship, stress of examination ,poor academic achievements, peer pressure, loneliness among children, single parenting etc. So it is necessary to prevent children from mental health problems from the childhood and provide them safe period so that they grow in adulthood so reduce health budget of the country . It would be excellent to talk to children and adolescent in schools and involve parents in PTA meeting. It is the need of time for the betterment of society at large. Indian academy of pediatrics can take lead role on behalf of Government of india, it is the only NGO looking after children and adolescent with 20,000 members who are spread-ed all over country. Its lovely to see the above comments, and I support most of them. Also with that I would like to add that at the University level more of Practical knowledge is necessary rather than ONLY theory. Proper supervision should be provided to the students during their internships et al. Other than the practical part, we as mental health professionals should contribute towards eradicating the Stigma of mental illness. And I would like to raise one question – we have health insurance in our country, then why not mental health insurance? Rehabilitation Council of India does regulate the practice of Clinical Psychology in India. All Cl. Psychologist are required to register with it. This appears adequate. A separate regulatory body/registering body for about 700 clinical psychologist doesnot sound practical at this time. Medical council of India regulates over 8 lakh medical practitioners of modern medicine. Will government consider a separate regulatory body for Psychiatrist in India who number over 4000? Then every medical speciality , nursing speciality, and other heath care staff will demand a separate body for their regulation so that they can write their own regulatory rule. Role of a psychiatric nurse, a psychiatric social worker, a clinical psychologist in a mental health team of modern medicine led by a psychiatrist must be clearly specified so that there is no team conflict. All health staff in a modern medicine mental health team have diffirent training, they can not be clubbed together as mental health professional who do same thing. Role of a psychiatric nurse, a psychiatric social worker, a clinical psychologist in AYUSH system if any and any independent role outside modern medicine team led by a psychiatrist if the Government so desires must also be spelt out specifically after due consultation and taking in their training and competence skills. Every person connected with mental health can not be a specialist physician of modern medicine like a psychiatrist who leads the mental health team just like all the health staff ( cardivascular nurse, technicians etc. ) connected with cardiothoracic surgery are not specialist surgeons of modern medicine but rather functon under the supervison and leadership of a cardio-thoracic surgeon. I would like to share a few more thoughts that I would like to share. Well not do we only need to have a regulatory body for psychologists. When the government cells should also have a team of mental health professionals, that include psychiatrists, clinical and rehabilitation psychologists and social workers, working together as a TEAM and not against each other. Also there should be some awareness campaigns or something on those lines, that speak to public about what mental illness actually is and what proper help would look like and where they could find it. I would like to say Thank You to this Mental health policy group and everyone who expressed their concern for the need of regulatory body and licensing system in India. I have proposed my PhD topic on this subject. Regarding my study, I will be taking psychologists’ perspectives on EXISTING SCENARIO OF PSYCHOLOGICAL PRACTICES AND NEED OF REGULATORY BODY IN INDIA. I am sure, this study will be very helpful to design the regulatory body and to understand status of Psychological practices in India. I agree with most of you for voicing your concern about the scrutinizing whether mental health practitioners need some kind of authentication. The status and definition of quality counseling/therapy is extremely vague and there is no clear guideline regarding the same, even with the prominent organizations. I also want to add here that the way Psychology is taught at colleges and universities across India is another matter of concern. I am into academics as well as counseling and I have seen people teaching the subject in a way that confuses the students to the core. This leads to ambiguous understanding of the concepts; like counseling, and hence results into malpractices. Can something be done regarding the pedagogy of making Psychology more practical and application oriented at college level itself? see under the heading ‘contact us’ to get in touch with the Policy Group members. My name is Rutuja.I am a practicing psychologist in Pune. Its absolutely a welcoming thing for all of us as professionals to have a policy that we can make. It will help bring about a lot of change in terms of awareness, rights, legalities, defined ethics etc in our field. I am thoroughly uncomfortable with psychological assessments being done by individuals who are not qualified for it. as the reports made most often than not LABEL everyone with some or the other disorder. Which according to me is utterly unethical. This policy will help us in doing away with this malpractice. I as a mental health professional would want to contribute towards this policy making. I would however want a sure way to communicate with the members of the policy group to put in my ideas across and be a part of this change!!! I am young mental health professional from Pune and currently I am working with this mental rehabilitation centre in Valsad. The constant struggle I face with my clients is the lack of awareness about mental illness, which causes my clients to relapse or difficult to re-integrate back into society. Recently on a fellowship in America, that empowers youth I came up with a way that we could psycho-educate the families as well as the nation on the whole about Mental Illness and how clients and families could get treatment. I appreciate Vikram Patel efforts to spread awareness about mental illness in various communities. Another issue that I struggle with is that there is no standardized government body that Psychologist on the whole can register with, this results in people getting into 6month courses and then practice as counsellors – which i believe is unethical -since if MBBS practiced without registration that would fall under malpractice. Mental health care is as important as physical health and we would all agree on that. The RCI has nothing to do with Mental illness! Like all foreign countries we should also have a governmental board that scrutinizes and keeps in control the people that practice and this should not be only based on academics and work experience, since we all know there are some really harmful counsellors and private practitioners out there! I am young professional, 24yrs to be precise and I am wondering how young professionals could be empowered to come forward and make a change, since no one in the current system is making any? To identify the processes and means to increase psychological counseling services in each school to protect and promote psychological wellness (health and mental health) of all children and their families. IISP,SC & G , strongly advocated School based counselor’s services to each student, to enhance all student’s not only; mental health services and develop skills in domains of Academic, personal/social , career options besides successful transition to college. •	Psychological wellness covers mental health and health-inventively to positive psychology, which focuses individual traits and abilities empowering to flourish, thus fostering developmental competencies in each child. •	Public authorities at districts level are made accountable for ensuring that the ultimate goal of the schools should be accomplished in promoting developmental competencies of the students, their abilities to successful transition to adulthood, in order to meet growing demands of the society. •	The schools in public or private sector should be developed to create and maintain all kinds of support services to provide students with the knowledge and skills necessary to lead productive and successful lives. •	Students life success do not grow with academic achievements alone, but vital to it are developing personal/social and emotional competencies. Promotion of psychological wellness are not ancillary to student’s academic score but integral to it. •	It is easier to educate happier children than those facing inadequacy of developmental competencies. The psychological wellness is a precondition of children’s success in schools and that the teaching staff are accountable to educate all children but a professionally trained school counselors through appropriate counseling services are responsible for insuring that all students have the psychological competence needed for learning. School based counselor’s Role and counseling services-The model do not pre -suppose that problems of developmental competencies of a school’s students does lie or limit solely to school counselors interventions alone, but it would percolate from individual class to school and further to district wide, matching the needs and degree of; at risk of the school’s students. School counselor’s assessment would assist in determining the kind of intervention; may be preventive/remedial, need based on the evidence of risk and disorders present and the case does not go untreated. •	To create, design and develop data base to assess student needs, establish goals, and measure results to ensure student success. The experts estimated an Indian eighth grader is at par with a South Korean third grader with regard to mathematical skills and a second-grade Shanghai student in reading skills. it needs an education revolution to improve the systemic rot by all the stakeholders,parents,teachers,educators and students and public policy makers must recognize the need of the hour. Hi ,i am very glad to see this policy.Currently i am pursuing a course in mental health in Canada.This is a very big necessity in India right now to have a services for mentally ill patients.Also need to improve the attitude of the general public regarding this illness to remove stigma about this illness.I feel no policies can be effective until and unless stigma is present in our society for mental illness and it is very crucial to educate the society first .From my side ALL THE BEST. i m dr. shailesh sharma MBBS , currently pursuing Master of Public Health in Health Policy, Economics and Finance from Tata Institute Of social sciences, mumbai..i came to know of this site while working on my research paper “Non-pharmacological preventive measures and interventions in mental health care applicable in PHC settings in India” and i was pleased to know that policy maker have invited reviews from people about the policy ….i have one suggestion to make here that while making mental health policy role of non pharmacological approaches (eg. behavioral therapy, music therapy, art therapy, activity therapy,interpersonal therapy etc.) should also be kept in mind specially in setting like India. such approach will help improve community participation and also help improve patient compliance and reduces the side effects of drug intake as often mental illnesses are of long duration. to mention here i have a case example of UK health system, Fulbourn hospital, cambridge practices music therapy and even in NHS of UK, Art therapist and music therapist are official jobs . We are a funding organisation and one current ptogramme we are supporting aims at promoting mental health among underprivileged pre-teens in Municipal schools in Mumbai. We find that both the school and home environment of children negatively impacts the mental health of these children. We request the Policy Group to consider how “a mentally healthy environment” can be promoted in schoopls. 1. Need to develop a universal guideline for mental health practitioners in India. 2. Need to develop a system where at least one counselor is trained and deputed per PHC for assessment and treatment of Common Mental Disorders. I think instead of deputing the work to other staff of PHC, who is already burdened with work, it will be better to create a seperate post. 3. Need to scale up the program for training Non Specialist Health Workers at national level to work in all the PHCs on a larger scale. Although there are some programs going on in bits and pieces in few states of India and as it has been found in the research that interventions delivered by trained NSHWs are equally effective to reduce the disease burden. 4. Registration a must of mental health professionals especially Psychologists and Counselors before they start their practice. 5. If start the licensing procedure like other countries, then India can be at par with the countries of developed world where a mental health care practitioner has to obtain a licence before they start their practice in government or private set up. 6. Need to develop a system where continuous monitoring and evaluation takes place of practitioners for maintaining high standard of quality. It has been about a month and only 8 responses have been received on the mental health policy website. It calls for widespread dissemination about the existence of the website. The policy shall be framed with widespread consultation with all stakeholders including general public. The policy shall be simple and reflect the shared vision. In modern system of medicine, psychiatrist is the specialist of the mental disorders. In modern system a specialist first trains as a MBBS and then does specialisation in respective specialty. This is important as human body doesnot function in isolated compartments. Problems of one system can easily present as symptom in another system. Many physical disorders present as psychiatric disorders. Co-morbidity is very common in mental disorders. Further a good communication and liasion with other specialties of modern medicine require that a specialist shall have MBBS training. All these requirements put psychiatrist as the leader of mental health team in modern system of medicine. Psychiatric nurse, Cl.Psychologist, PSW, OT are widely recognised as important members of the mental health team but at the same time it is universally accepted that a psychiatrist is the leader of the mental health team and specialist of mental disorders for modern medicine. Psychiatric nurse, Cl.Psychologist, PSW, OT play important role in the team under the overall supervision of the specialist of the team who is a psychiatrist. The apprehensions of some people that the role of clinical psychology and its standards are being downgraded citing national policies (Naveen, 23 May) is untenable as its role has been retained and substantiated in the draft mental health care act’ 2010 even at the cost of larger public interest. To realise this one only needs to see the definition of a psychiatrist and the definition of Cl.Psychologist in the said document. Where Govt. can recognise any medical officer as a psychiatrist it can not recognise any psychologist as a Cl. psychologist for the purpose of the Act. This despite the fact that there are over 4000 psychiatrist and only 600 Cl. psychologist in the country. Further, the RCI Act prohibits other persons apart from Cl.Psychologist to carry on the role of Cl.Psychologist such as IQ assessment, psychotherapy etc. but MCI act doesnot prevent a MBBS doctor from diagnosing and treating mental disorders. This should have prompted the drafting committee to keep a provision of declaring a psychologist with some training as a Cl.Psychologist for the purpose of the meantal health care Act so that the provision in RCI Act is superceded by it. This would have given the legitimacy to trained psychologist to function as Cl Psychologist for the DMHP programme. But it has not been done so and even then there is hue and cry about down grading the Cl.Psychology which is not understandable. It needs to be made clear that in modern system of medicine a specialist requires two qualifications one of that is MBBS and the other is the specialist qualification. If Cl.Psychology is to be a medical speciality then cl. psychologist have to do MBBS so that they can examine and evaluate the whole human body. Till that time Psychiatric nurse, Cl.Psychologist, PSW, OT will have to function under the leadership of a psychiatrist in their specified role. The role and definition of a profession or a specialty is not set by an Act but by the amount of disease burden and service to the society it provides. For example, Psychiatrist has been defined in a very diluted term in the current mental health act’1987 but that doesnot in any affect the position of a qualified psychiatrist in any way in the society. Cl Psychology and others need to come out of their insecurity and leave their fixation with definition in the mental health care act which is only for the purpose of the Act. They can still have their standard definition outside the Act. The urgent need is to provide services to the unreached people and if for that a dilution of definition or deprofessionalisation of services is required it should be gladly welcomed by all, Cl. psychology included . We all first serve the society and only after that our professional role as mental health or rehabilitation professional comes. With such an acute shortage of mental health personel there is no way but to have non mental health professional deliver services after short training. This is more applicable for psychiatric nurse, Cl.Psychologist and PSW as there number is even less than that of psychiatrist. The mental health policy shall recognise that mental health services at primary and secondary level will be provided by general health professionals trained in mental health if the treatment gap of about 95% in mental disorders is to be addressed. should be a focus area. As a mental health professional , I feel most people don’t realise the importance of mental health , despite whatever our definition of health is mental health is still not as well integrated in our system as it should be. Most people still feel “ashamed” or “embarassed” to go to a counsellor or a psychologist. Terms like depression are even loosely used. Mental health not only encompasses the psychological morbidities but it should also take care of the preventive measures. I know of so many people who have stopped taking medication or have more faith in the baba than the doctor. Its ok to go to a doctor if you have a heart problem or a high BP but people would think twice before going to a “shrink”. I feel there needs to be some form of mainstreaming that needs to be done and at the same time only trained and qualified people should be employed. The “talking cure” is being misused by quite a few smart well spoken professionals and run tuition centres in the name of helping children with learning disability or the testing centres that label children rampantly as ADHD or ADD or dyslexic. The use of too much medication where a patient is so drugged through the day that s/he barely has any clue of his surroundings. The lack of care givers and half way homes especially in the north. There is so much that needs to be done and I am glad that we are finally taking those steps. Mental health care services will remain overly strained unless clinical psychology profession’s role is understood in fair and just terms. But again going by the experience of attending one of the meetings for mental health care act draft (which was sheer waste of time and energy), a fair role and definition of clinical psychology seems wishful thinking. This is true. Nowadays policy is being framed more and more on the basis of scientific valid facts rather than on rhetorics and uninformed neglect of past. There is now strong evidence for presence of mental disorders in all parts of the world right from the most deprived strife torn regions of the world to the most developed and high human index regions. This means mental illness is unlike malaria or TB which is confined to a very limited number of countries and pockets. Further moving from the concept of mental illness to mental health the whole population becomes the target of such measures. We need basic mental health care in all regions of the country. Sixty years after independence we have to run a National programme for establishing the most basic mental health facility in our districts tells the sorry state of affairs. Still more than half of the districts in the country do not have a single psychiatrist. People have to travel long distances for even OPD consultation. But even this basic requirement will be questioned by peoplewho think mental illnesses do not exist in some parts of the country or mental health is not required to be promoted in some regions of the country if not the whole nation. The modern medicine works as a team of health workers, paramedical staff, doctors , specialists, superspecialists. Psychiatry is a broad speciality and is required at least at the district level to provide referral support to general physicians, treating complicated cases, providing liasion services to other specialties. Like wise Psychologist, social workers, nurses, occupational therapist are required to assist the psychiatrist in the basic mental health care as well as supporting other specialties. I am sure the policy group will collect all the evidences and numbers and arrive at the need statment and propose their recommendation based upon it. As I understand there is great need to integrate and involve other programme areas and specialties as well. It would have been good if policy group would have comprised members from general health, public health, medical council, film , media, general vocal citizen. Without including and involving them and we run the risk of not taking them aboard and invite their neglect and cynism and keeping mental health alieniated. The group comprises people only from mental health sector either users or providers and this severely restricts the group in its outlook and may bring in a very restricted picture and solution. It would be good if after few meetings the group can have a relook at its constitution and functioning of its members and have a resuffle to make it more representative. Mental health stakeholders do not mean people working in mental health or active users of mental health system. They include all people and that is why we shall have representatives from all walks of life. There could be subgroups for specific tasks. I am sure the dynamic leadership in the ministry is well aware of this issue and it will be taken care of in near future. I feel the first and most vital thing to do is determine with accuracy, the extent of the problem and define the nuances of mental health or illness as the case maybe. Be it TB or mental health, or malaria, we never seem to have a grasp of what the real numbers are. We are always operating on guesstimates and that comes in the way of progress. Without reliable data, nothing can ever be justified, least of all demands for reform. It is is the best time for the group to empower persons with Mental Challenges. The best option is to plan the policy with Human Rights model approach in the minds. Without losing more time the policy should be framed and implemented. Finally after a long wait the group has been constituted. The TORs are quite elaborate. Lets hope most of the TORs are achieved within the timelines. The mental health policy document emerging from this exercise shall form a part of the National Health Policy rather than a separate stand alone, excluded, marginalised National Mental Health Policy if we are to move towards integration of mental health in general health. 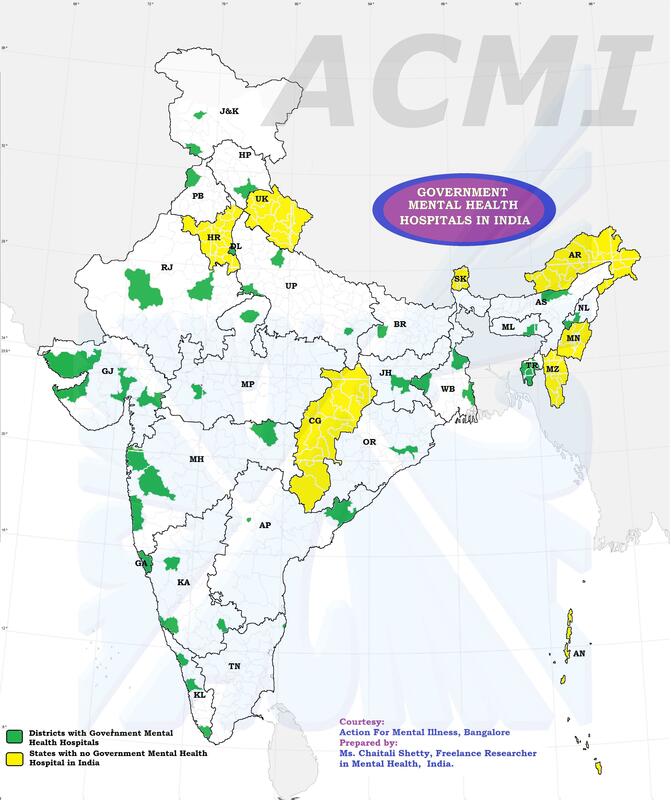 Separate Mental Health Policy by Gujarat and Kerala Government have not achieved any thing more worthwhile than stake the status of States in India with a separate mental health policy. Separate mental health policy works in places where there is separate infrastructure for mental health services rather than piggy backing on general health infrastructure. Unfortunately, in India with limited resources and a huge population we have to depend upon primary and secondary general health services to deliver the mental health care. We donot even have a full fledged mental health division at either State level or at the central level and we are moving towards a separate mental health policy. It would be wothwhile to study the effectiveness of the separate mental health policy of Kerala and Gujarat states before going the same way. Some of the developed nations are realising that having a separate policy for mental health is counter productive for development of mental health sector which then always remains a laggard and are contemplating a unified health policy with full inclusion of mental health issues and components. We need to read through the whole mental health component in the National Health Policy and then add the components and areas which need further elaboration. Multiple policy documents for different disease programme will severely restrict their readership and limit its effectiveness to a showcase document which is hardly ever used. The document shall be framed keeping in mind its readership (general public, general health staff, administrators etc. ) and shall be brief , simple to understand , yet comprehensive and mainstream mental health in its text as well as its form i.e. it shall be part of general health policy document. All the best and support to the policy group in their noble endeavour.